I had the enormous pleasure of finally trying this drink for my birthday this year and LOVED it! I love chocolate and though I rarely drink, when I do, my beverage of choice is something with Vodka. (Usually my own concoction of blueberry lemonade which I may get around to posting one of these days.) In the meantime, I went to look for this cocktail recipe and found not only the recipe but the most amazing photo of one that was served at a lounge, in Las Vegas. The added advantage of posting this on my blog is that it’s a quick and dirty way to get to the recipe when and if I get around to making one or two of these myself! This is creative mixology at it’s finest. This drink tastes every bit as decadent and scrumptious as it looks. 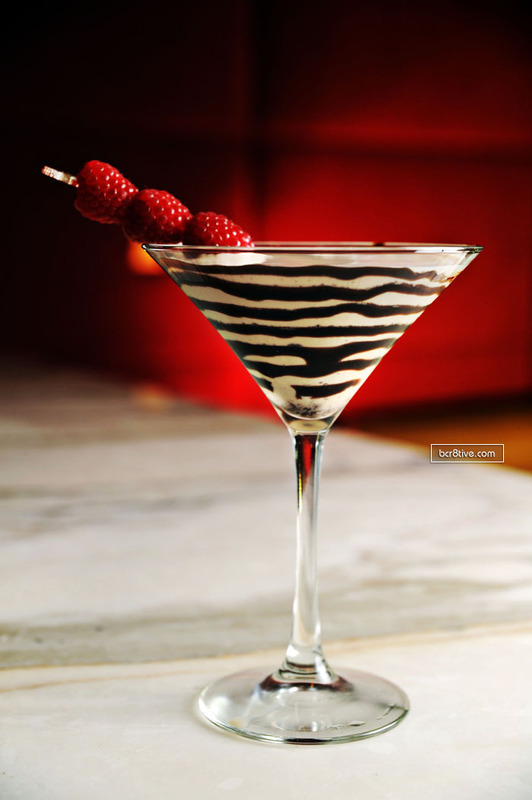 Swirl Godiva Dark Chocolate inside the bottom of a chilled martini glass. Fill a martini shaker with ice. Add Godiva White Chocolate Liquor, Kai Lychee Vodka & Cream. Shake vigorously. Pour into the martini glass and garnish with raspberries.